WASHINGTON––The Obama administration is set to inject millions of dollars into a group of cutting-edge education providers to address a vexing problem: Many Americans are leaving college with debt but without skills the economy needs. It is turning to the private sector for help. In a novel experiment, the Education Department plans to announce Tuesday up to $17 million in loans and grants for students to undergo training at eight entities that aren’t traditional colleges. Most of the sites are for-profit companies. They include coding academies such as New York startup Flatiron School and Oregon-based Epicodus, as well as websites such as Study.com and StraighterLine that provide online courses at reduced costs. The most unusual of the group is corporate behemoth General Electric Co. GE 0.00 % , which won’t receive funds directly but will provide training at one of its jet-engine plants under the program. Until now, the half-century-old student aid program has been restricted to students at community colleges, universities and trade schools that must first win approval from a regional accreditor composed of fellow college leaders. The Education Department said that peer-review system has allowed colleges to become complacent in shaping curricula to keep up with technological advances, and that alternative providers can inject competition into higher education. The program will let up to 1,500 students in the coming academic year enroll in a select group of traditional colleges while undergoing much of their training at the eight nontraditional providers, ultimately leading to degrees. As with educational loans for traditional colleges, the grants will be made to students who will then pay the alternative providers. The program, called Educational Quality through Innovative Partnerships, or Equip, is largely designed to enable low-income Americans to learn skills in areas where colleges often fall short, such as learning how to write computer code, or using new software to operate high-tech manufacturing equipment to make jet engines. Ted Mitchell, the Education Department’s undersecretary, said the program is part of a broader trend, accelerated since the recession, of colleges turning to employers to learn what skills to teach. The program marks a shift in the Obama administration’s approach to higher education. The Education Department has taken a hostile stance toward for-profit schools, which it has accused of using deceptive marketing while earning billions in profits off federal student aid. Some academic experts say that by opening up federal aid to for-profit companies, the Equip pilot program risks inviting the same abuses. Mr. Mitchell said the agency will closely monitor how the funds are spent, with a “laserlike focus” on whether students find decent-paying jobs afterward. Officials point to an economic imperative for change. Enrollment in higher education just underwent a historic boom, but the outcomes have been mixed. College enrollment soared 20% between 2005 and 2010, the biggest increase since the 1970s. Yet millions of students never graduated, and among those who did, many couldn’t find jobs. At the typical four-year public college, only 48% of first-time, full-time students graduate within six years, according to a report this month by Third Way, a nonpartisan think tank. Meanwhile, nearly half of all college graduates hold jobs in fields that don’t require their degrees. About 44% of college graduates are underemployed, according to the Federal Reserve Bank of New York. The Equip program is designed to address those issues. Graduates at coding academies like Flatiron are learning skills in high demand among employers, and they are quickly finding high-paying jobs after graduation. Websites like Study.com allow midcareer professionals to earn credits at their own pace at far lower prices than charged by traditional schools. Academics say lower costs increase the likelihood of a student graduating. 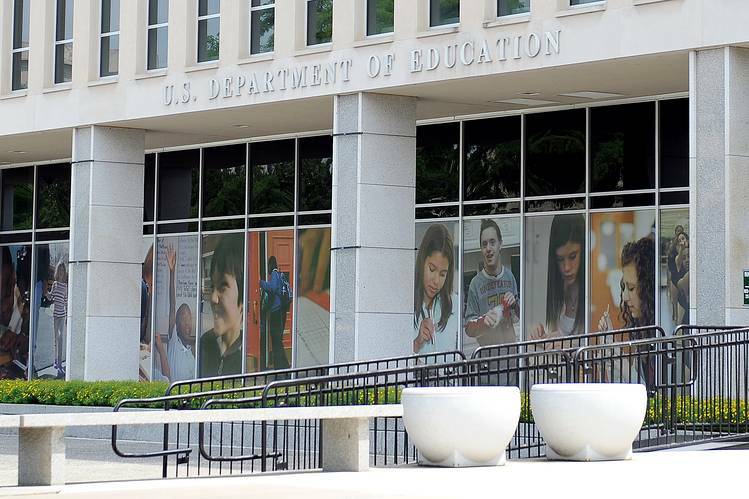 The Education Department is conducting the program under a federal law that allows the agency to temporarily waive legal restrictions on how federal aid is spent. The agency said the pilot program will allow future administrations to determine whether to press Congress to pass legislation to permanently open up federal student-aid dollars to nontraditional providers. The Equip sites set to be announced Tuesday include GE, four coding academies and several companies that provide online courses in traditional subjects such as English and math at costs far cheaper than at traditional schools. Education Department officials say the programs will target students who never went to college and midcareer workers who are looking to upgrade their skills. GE’s aviation unit will partner with Northeastern University in Boston to allow students to undergo training at one of the company’s jet-engine facilities while working toward a degree in advanced manufacturing. Dozens of GE employees will make up the initial batch of students, the company said. Northeastern President Joseph Aoun said college instructors will teach courses at the facility focused on how to use software to operate machines, giving workers hands-on experience. Funds from the Equip program will go to Northeastern to cover tuition, he said, while no funds will go to GE. Mr. Aoun said the university has for years partnered with private employers to allow students to get “experiential learning” on job sites as part of working toward bachelor’s degrees. He said the practice has allowed the school to increase the share of its graduates who find well-paying jobs after school. “Other universities are waking up” and determining that teaching specific, on-the-job skills is a necessary part of a degree, Mr. Aoun said. The eight sites under the Equip program are GE, Flatiron, Epicodus, StraighterLine, Study.com, MakerSquare, Zip Code Wilmington and Guild Education.